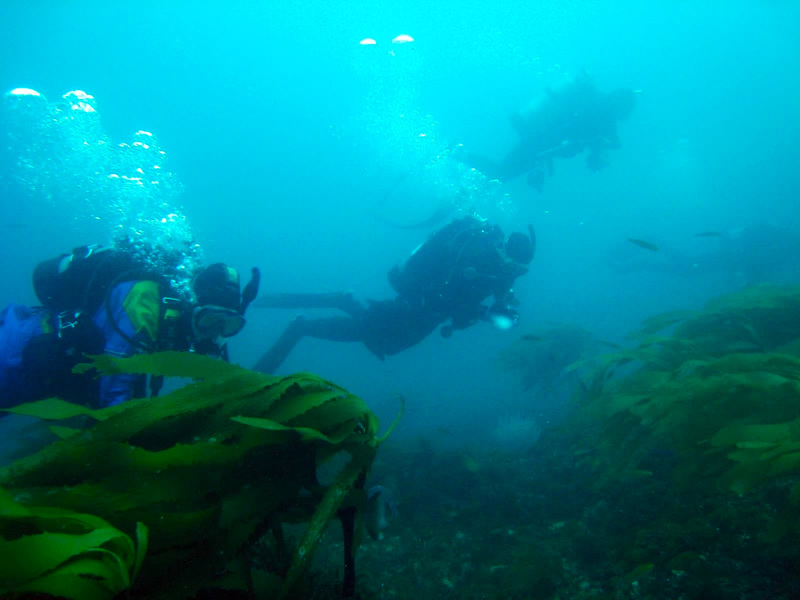 Scouting with Scuba for Abalone? Answer: The photographer in scuba cannot assist the free diver in any way. The action you describe falls within the definition of “take” under the Fish and Game Code and its regulations (see Fish and Game Code, section 86 and California Code of Regulations Title 14, section 1.80). Both the abalone diver and the photographer with scuba gear may be cited for violating CCR, Title 14 section 29.15(e), which prohibits the use of scuba gear to take abalone. Answer: The reason is because previously in the regulations, the basses (kelp, sand and spotted) all had 12 inch minimum total lengths or 6½ inch minimum fillet lengths, and were required to retain 1-inch patches of skin still attached for identification. Ocean whitefish fillets looked so similar to the bass fillets that they too were required to measure a minimum of 6½ inches with skin attached to avoid confusion with the basses. This year though fishery managers increased the minimum lengths of the basses to 14 inches and the minimum fillet lengths to 7½ inches. Because there was no biological reason to increase fillet lengths on the ocean whitefish, scientists chose to leave their minimum fillet lengths at 6½ inches and to require all skin to be left on so that there still could be no mistaking ocean whitefish fillets with fillets of one of the three bass species. Question: My father-in-law is interested in big game hunting. Unfortunately for him, he has a non-violent felony conviction which bars him from possessing a firearm. This will allow him to only hunt via archery methods. Does he still have to take the standard hunter safety course or is there a special class for archery only? I have a feeling he has to take the standard course even though all the firearms questions will have no bearing on his archery tackle pursuit. If he does take and pass the course, may he still hunt during the general deer season using a crossbow with me? Answer: He will still have to take Hunter Ed, but he will have to find a class that does not use real firearms or have a live-fire requirement in the class. While signing up for the class or else at the very beginning of the class, your father-in-law should notify the instructor immediately of any firearms restrictions he may have. Then the instructor can determine how best to accommodate him during the class. For a list of available hunter education classes in his area, please go to http://www.dfg.ca.gov/licensing/hunting/. Hunter Ed isn’t just about firearms. It includes all forms of hunting, hunter safety, conservation, ethics, etc. In most cases convicted felons are not restricted from using archery equipment or air rifles but he should check with his parole officer or the court to make sure the conditions of his case do not preclude using these methods of take for hunting. Answer: Spearfishing is permitted in some rivers, such as those in the Colorado River District and the Valley District (as authorized under CCR Title 14, section 2.30) but primarily only for a few species of non-game fish. New this year, spearfishing for stripers is now legal in the Valley District. Even if just practicing your techniques, don’t forget your fishing license! Otherwise, the use and possession of a spear within 100 yards of any canal, river, stream, lake or reservoir is specifically prohibited (CCR Title 14, section 2.09).